Thank you for visiting our website and for your interest in our swim school. As co-founders and owners of Swim Tank, we know that choosing the right swim school for your children can sometimes be a difficult and overwhelming process. We are sisters, and like you, we are parents who want our children to be happy and safe. We don’t just own our business, we work here and we have had our own children go through the program so that gives us a unique perspective as owners, operators, and parents. We both strongly believe that knowing how to swim is a fundamental skill that every child should learn. Our experience and training has taught us that teaching children to swim is best accomplished in small ratio classes (semi private at the beginner level), with highly trained instructors, and manager oversight and quality control. As parents our number one job is keeping our kids safe and the way we do that is by teaching them to avoid dangerous situations. We spend a countless number of hours every day talking to our kids about how to be safe. Not running into the street, buckling their seat belt whenever they are in a car, and being aware of stranger danger, are among the rules that parents continuously try to get their children to understand. However, out of all of the things that we try to protect our children from, the leading cause of accidental death in children from the ages 1 to 4 years old is drowning. It is also the second leading cause of accidental death in for children ages 0 to 19 years old. Our mission is to give your child the experience to know how to avoid a hazardous water experience, and the ability to survive that experience if they can’t avoid it. Almost all drowning incidents are preventable, and with education and training we can change these statistics! Beyond accident prevention, swimming is a life long skill that will provide your children with endless opportunities to enjoy all the wonderful experiences water has to offer. Opening the door to the life long sport of swimming is one of the greatest gifts that you can give your child! There are many different paths when learning how to swim and Swim Tank is just one of those paths. The most important thing is to get your child started with a reputable program. The younger you can start the better, but it is never too late to start. When choosing the right swim school for your family our best advice is to research! Check out our website and make sure you take some time to read about our philosophy, our staff, and our lessons to see what makes us different. If you choose to start your swim journey with us we will be here to support you and your family throughout the entire process. We want every family that comes to Swim Tank to have a positive cooperative relationship with us. We do not want anyone to feel like they are a faceless number. We will never stop working to offer the very best to our students. Empowering children to be safe in and around the water is our mission, and preventing drowning is what drives us every day to make Swim Tank the best that it can be. We have dedicated our lives to this mission and refuse to sacrifice quality for any reason. At Swim Tank we are committed to the progress and success of each and every one of our students. We hope to be able to work with you and your family and be a part of this amazing journey! 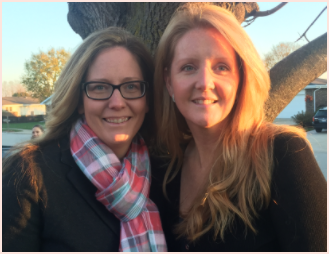 Aileen Crampton Bucciero and Fiona Crampton Kearney founded Swim Tank in 2013, but the roots of Swim Tank began over 40 years ago with a swim program called Aqua Tots, which is where Aileen and Fiona were both trained and mentored by their friend Patti Marano. Patti Marano was the founder of the original Aqua Tots program, which is where Aileen and Fiona first learned how to teach swimming. They had both taken the usual lifeguarding and water safety instructor courses, but the real learning began when they mentored with Patti. Patti believed strongly in consistency, facing your fears, and keeping low teacher to student ratios for beginner swimmers. Her philosophy of water adjustment and her series of beginner swimmer techniques were her own unique development from her many years as a swim instructor. Aileen worked side by side with Patti for 5 years after college and Fiona trained with Patti throughout her college years and joined Aileen full time upon graduation. They both realized early on that they had a passion and natural talent for teaching children how to swim. In 2001 they took over the small swim school, which had about 350 students at the time. Over the next decade they improved and expanded the business. Their mission was simple; empower children to be safe in and around the water by offering high quality, low teacher to student ratio swim classes. In 2013, after years of renting college pools, their dream of having their own facility finally came true and Swim Tank was founded. With thousands of students now attending Swim Tank classes the dream continues to grow. The program and the philosophy stays true to its’ roots but it has been cultivated and expanded to include multiple levels of swimming, and a growth mindset philosophy.